Slow Art Day has asked its 2013 college interns to write short summaries of their own experiences looking slowly at artworks of their choosing. Sylvia Faichney, Slow Art Day intern from the Art Institute of Chicago, writes here about her experience seeing the unexpected. I’ve learned that through my practices of looking slowly that even after looking at a piece one, two, or even three times slowly I still may not have seen all that it has to show me. Despite believing that looking slowly over several visits can yield ever more insights, I had the surprising recent experience of going to my favorite museum and looking at one of my favorite pieces of art and finding that there were significant elements that I had previously completely missed. Living in the city of Chicago I have access to multiple galleries and museums. The Art Institute of Chicago, however, is one of my favorites. I’ve visited multiple times and I have it almost memorized. I know it so well that I know what’s around every corner. Or so I thought before I did this slow looking exercise for Slow Art Day. On my visits prior to the one for this exercise, I have sat and tried to understand why these four separate canvases are somehow cohesive. I previously have noted that although each composition is different there is a unity created by the colors. Today, when I sit for my third time in front of this wonderful set of four paintings, I discover that not only the composition but the colors play a key role in creating the cohesion. When I look at it one way, I see chaos and separation. The paintings can appear to be disconnected. 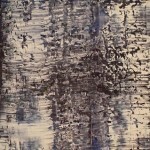 But, Richter in his genius somehow uses the chaos in a way to connect. 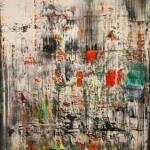 Further, the emotional feeling I experience from this chaotic connected work is calm. I don’t know how he does that. He uses a wide variety of colors. The pieces are complex. 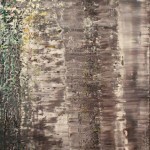 The texture is rich and constantly yielding new insights. A few minutes go by and I notice something I hadn’t before. What is that big streak of grey? The movement had always seemed so consistent to me and there in front of me was a break in the pattern created by this rather large diagonal grey streak. My eyes move along to the other canvases to where I find that there is another break in the pattern I had missed. There it was, a curved orange, green, and blue brush stroke that I had missed on my previous visits. I ask myself this question as I continue to look and follow the movement of these new-found curves. I become astonished – not only am I seeing these new patterns but I’m also seeing colors I had missed or misunderstood previously. For example, the color I had always assumed was grey in the compositions, appears in fact to be purple. This was a huge shock to me. An entire color in all of the compositions that had looked one way to me begins to appear as a different color. And this true color that I had just now noticed changes the tone of each piece. It’s quite dramatic. After realizing this I also discover undertones of other colors I had previously not noticed – a dark green, a yellow, different shades of blue all begin to reveal themselves. As I look closely, I see that they had been cleverly tucked away behind layers of more prominent colors. I can’t believe that after all of the time I have spent in the past with these paintings that I am seeing so much more – and so much that I had misunderstood. Despite my surprise and shock, at the end of my slow looking exercise I feel that calm from Richter – so calm that I’m rejuvenated. I’m not tired. I’m not burnt out. I’m excited and my senses are heightened. I get up to leave but before I go I take a quick look at the description written by the curators. “…Impulses and contradiction of representation urging skeptics in the evaluation of the purpose and effect of all constructed visual phenomena.” I’m not sure what they mean but I think I agree. When I’m back home and reflecting on my experience, I realize that I really thought that I wouldn’t experience anything new from looking slowly at these Richter paintings for a third time. Now I see that I may never be done learning, and that maybe there are certain art works that take many visits to fully experience. Even in my favorite corner of my favorite museum that I have been to many times, I now know that I can sit down and ask myself if I really have seen it all. 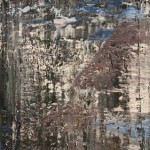 Gerhard Richter’s Ice 1, 2, 3, 4 among other great works are available to view at the Art Institute of Chicago. The Art Institute of Chicago is not currently a 2014 Slow Art Day venue. Sign up to host here!